Thursday, November 3 from 6:30-7:30 PM at The New York Society Library - Members' Room, Katherine Leiner - Author, Andrew Lipton - Photographer and renowned Northeast beekeeper Andrew Coté will speak about food sustainability, photography and beekeeping as well as other matters of organic nature. Growing Roots is about a new revolution in food involving people living sustainable lives that revolve around healthy, natural food. The book introduces farmers and beekeepers, fishermen and chefs, food activists and cheesemongers, and many more across the nation. Also included are filmmakers, writers, and artists who are changing the way society eats and looks at food production. Library Journal calls it "inspirational and entertaining reading." In this event, author Katherine Leiner will discuss meeting and profiling the diversity of participants, and photographer Andrew Lipton will display his stunning images of farms, food, and people. In addition, Andrew Cote, founder of the international poverty-alleviation organization Bees Without Borders, will add his perspective on beekeeping and teaching others to improve their lives with bees. Katherine Leiner has been writing since she was a child. She has published many award-winning books for children and young adults and, more recently, her first novel for adults, "Digging Out," published by Penguin. She is working on another novel due out in 2012. Thursday, September 22 at 7 PM at the Mancos Public Library, Katherine Leiner will be speaking about Growing Roots and her newest book, "Beyond the Lemonade Stand," with Joan and Peter from Wintergreen Farms. Wednesday, September 21 at 8:30 AM MST, Katherine Leiner will be speaking with Melissa Betrone who comes to broadcasting after 17 years of growing organic vegetables and working on other organic food landscapes around the nation. SEPT. 10: SPEAKING AT THE DURANGO PUBLIC LIBRARY: "THE FUTURE OF BOOKS"
Saturday, September 10 from 2:00-3:30 PM, Katherine Leiner will be at the Durango Public Library as part of a panel discussing "The Future of Books." 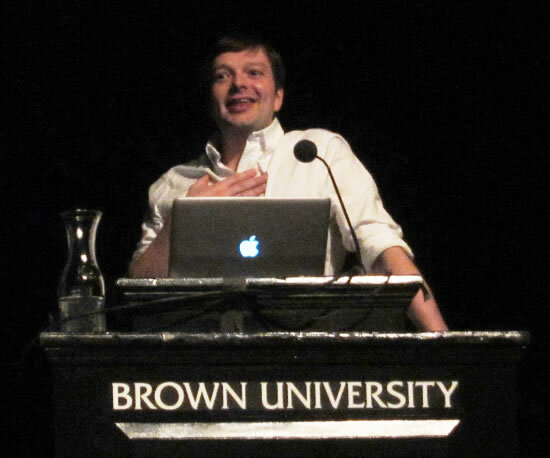 spoke at Brown University for the Casey Shearer Memorial Lecture, introducing all of us to FoodCorps. Growing Roots and Katherine Leiner will be signing books before the lecture. Curt Ellis of King Corn and Truck Farm will be the speaker. Featuring Growing Roots and Katherine Leiner along with Jen Small and Mike Yezzi from Flying Pigs Farm. Listen to the interview online HERE! Ian Cheney and Curt Ellis (Filmmakers) Andrew Coté (Beekeeper), Jen Small or Mike Yezzi (Heirloom pig farmers).